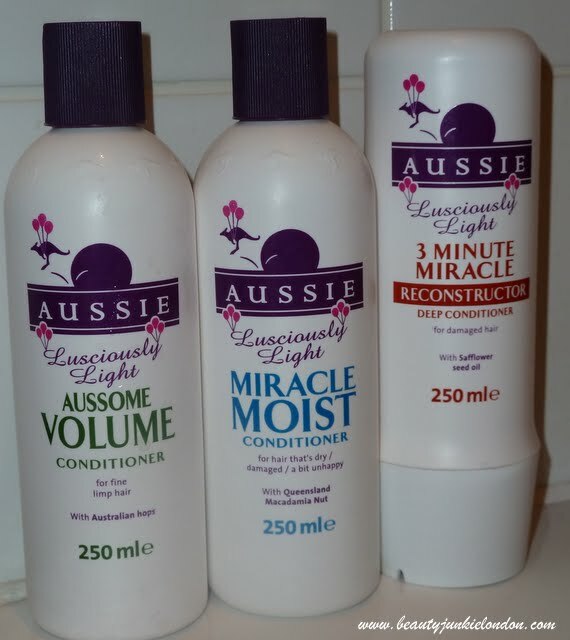 Aussie have recently launched a new range of conditioners, all the same as the current line but with the addition of them being ‘lighter’ than the originals. For someone who has fine hair that is easily weighed down, then this is amazing news. I was thinking about the thing about Aussie hair products just this morning as I was washing my hair and there really isn’t anything more delicious smelling than Aussie for the hair. I sometimes just open the bottle just to sniff them. Of the three conditioners from the new range that I’ve been trying I like the Aussome Volume & 3 Minute Miracle the best, purely for the smell. The miracle moist is a great conditioner but I have to find something to distinguish them between each other! The The whole Aussie range is currently 2 for £5.99 at Superdrug or 3 for £10 at Boots. I have always found Aussie to have great conditioners. I LOVE the three minute miracle! I had no idea they launched a lighter formula, but I also have fine hair so I’ll definitely try these out. I hope they’re as moisturizing. Awesome. I love Aussie but having fine hair always found the conditioner a bit much. A lighter version is ideal!! Ooh this is good, I have quite thick but porous hair so sometimes too much conditioner weighs it down and I have to wash it more, this looks good!